How I would love a church that is poor and for the poor (Pope Francis, General Audience, 2013). There are millions of people who are homeless in America. Millions, not thousands; old and young alike. 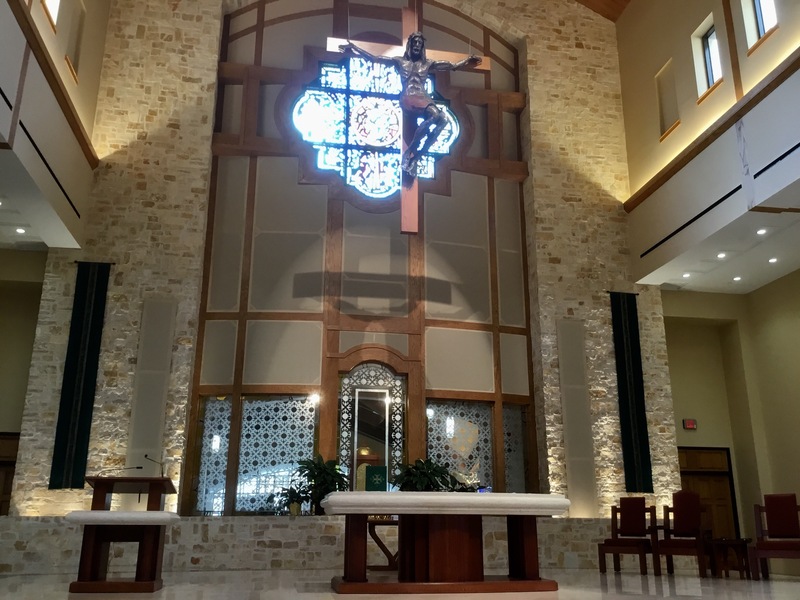 Yet newly built, protestantized churches like the above abound – and they call themselves Catholic. Not one flower is to be seen near the tabernacles in which God the Most Holy Trinity resides, or near the statues of the Blessed Virgin Mary. Yet they pride themselves in being Catholic. Was Christ born in a cold and dirty stable in Bethlehem, because his Mother and foster father were homeless and no one took them in, or was He born in the palace of Herod? You have left your first love (Rv 2:4). Where is your love? Do you even know what love means? Where is your devotion and fidelity to God? In the parking lots full of sports utility vehicles and ‘trucks,’ the vast majority of which seem to have been released within the past few years – while your own people, your very own people, sleep in the streets or under bridges, and eat food out of dumpsters behind big box stores? Are you a first world nation, America, or a third world nation? Where are your hearts, O People of God? Whoever eats the bread or drinks the cup of the Lord unworthily will have to answer for the body and blood of the Lord. A person should examine himself, and so eat the bread and drink the cup. For anyone who eats and drinks without discerning the body, eats and drinks judgment on himself. That is why many among you are ill and infirm, and a considerable number are dying (1 Cor 11:27-30). What about your Masses, often standing room only and with innumerable stations for communion under both species, the distribution of which at times lasts almost 20 minutes – only to find not more than 20 people, if that, for the sacrament of confession on any given Saturday? And that when confession is even offered. What about not a few of your priests, more often than not prancing around for homilies and during which some, for example, on a Solemnity in the Catholic Church, dare to ask if any of the faithful in the pews have dressed up as a lobster on Halloween? Not to mention a narration by one cleric, during the homily, about how much he enjoyed visiting Graceland and the house of Elvis Presley, ‘the King.’ What King? Who is the real King? Where is God? Is this “very reverent” as was said? Is this the “return to the solemnity of the Mass” as was claimed? And the king will say to them, ‘Amen, I say to you, whatever you did for one of these least brothers of mine, you did for me.’ Then he will say to those on his left, ‘Depart from me, you accursed, into the eternal fire prepared for the devil and his angels. For I was hungry and you gave me no food, I was thirsty and you gave me no drink, a stranger and you gave me no welcome, naked and you gave me no clothing, ill and in prison, and you did not care for me.’ Then they will answer and say, ‘Lord, when did we see you hungry or thirsty or a stranger or naked or ill or in prison, and not minister to your needs?’ He will answer them, ‘Amen, I say to you, what you did not do for one of these least ones, you did not do for me’ (Mt 25:40-45). And what about the ‘welcome packets’ that are sent by these kinds of churches – packets containing nothing more than a thick stack of envelopes for tithing? Is this the desire of the heart of the Divine Father toward those who cross your thresholds? Do you even know what God wants from His people in relation to others? Christ, on His visit to the temple centuries ago, flew into a rage, made whipping cords and used them to drive the marketeers out of the house of the Heavenly Father, as the anti-priests of the time had turned the temple into a veritable marketplace (Jn 2:15). And it is happening again. Saint John Paul II, when a simple parish priest, had nothing but a single change of clothing and one pair of shoes to his name. He did not even own a coat, despite the hard, cold weather. Benedict XVI has stated without equivocation that the spirit of the liturgy has been lost in such places. Francis has called without hesitation on a number of occasions for a poor Church for the poor. Then Jesus said to his disciples, “Amen, I say to you, it will be hard for one who is rich to enter the kingdom of heaven. Again I say to you, it is easier for a camel to pass through the eye of a needle than for one who is rich to enter the kingdom of God” (Mt 19:23-24). Yet the affluent churches in the United States do not hesitate to call themselves Catholic. Posted in God the Father, Jesus, On Sin and tagged America, God, Jesus Christ, rich churches on December 3, 2016 by mba. Posted in God the Father, On Sin, Stones of the World, The Church, The Father's Words, The Judgment, To Priests, Tribulation and tagged Christianity, God, God the Father, Judgment, Religion and Spirituality, The Church, The Father's Words, Tribulation on October 15, 2013 by mba.